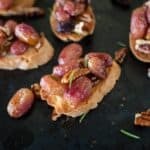 This Roasted Grape Crostini recipe with Rosemary and Pecans is one of my go-to appetizers throughout late summer and fall. It’s perfect for causal wine + cheese with friends, and elegant enough for upscale parties. Note – sometimes you get a few burned bits on the edges – it’s all good. Just avoid the blackened bits when you gather the roasted grapes for the topping. Grapes are fabulous on their own, of course, and perfect in salads, on cheese plates, and in wine. Raisins make cookies, cereal, and pastries better, and they are the not-so-secret ingredient in all kinds of products, including steak sauce and soda. 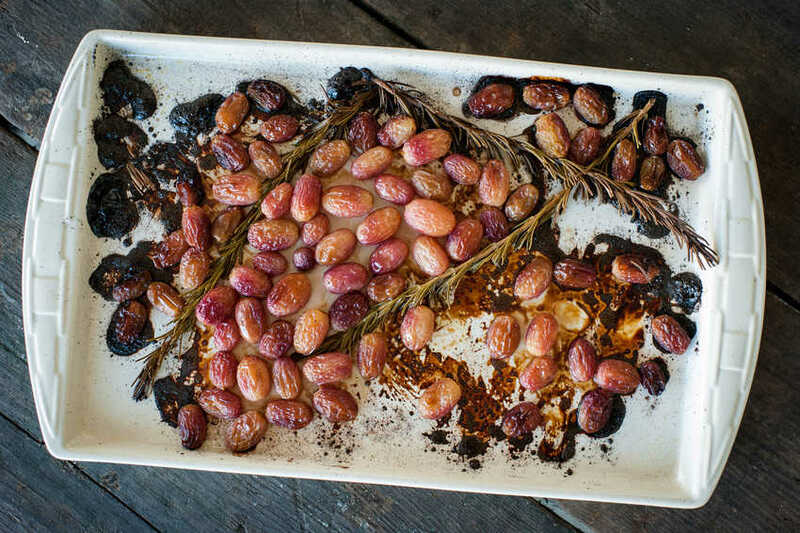 But there’s a sweet spot right between fresh grapes and raisins that really ought to get its due: the roasted grape. I like to roast grapes on high heat for just a bit, so the sugars caramelize and textures change, but the fruit remains mostly intact. You can roast the grapes longer (20-25 minutes) and scoop the fruit and caramelized juices into a bowl for a jam-like consistency.I’ve used Bread Srsly gluten-free sourdough to make toasted triangles, and since it’s vegan too, that’s the easiest way to serve this roasted grape crostini recipe to an allergen-sensitive crowd (you could also omit the pecans if needed). If the crew I’m hosting isn’t dairy-free, I use the Against the Grain frozen baguettes. I also like the gluten-free baguettes from Mariposa Baking Co., and those are vegan too. Slice the baguettes in 1/4 inch rounds, brush lightly with olive oil, and place on a baking sheet. Toast the bread in the oven for 15-20 minutes, or until golden. Turn pan during baking or flip slices over if needed. Allow to cool. Line a rimmed baking sheet with parchment or a Silpat. Remove the grapes from the stem, and toss them together with the rosemary sprigs, pecans and 2-3 tablespoons olive oil over the baking sheet. Spread the grapes and nuts out so that they’re in a single layer, and place the baking sheet in the oven for 10-12 minutes, or until the grapes have just begun to wilt and a few have started to burst. Remove from the oven and season evenly with salt and pepper. 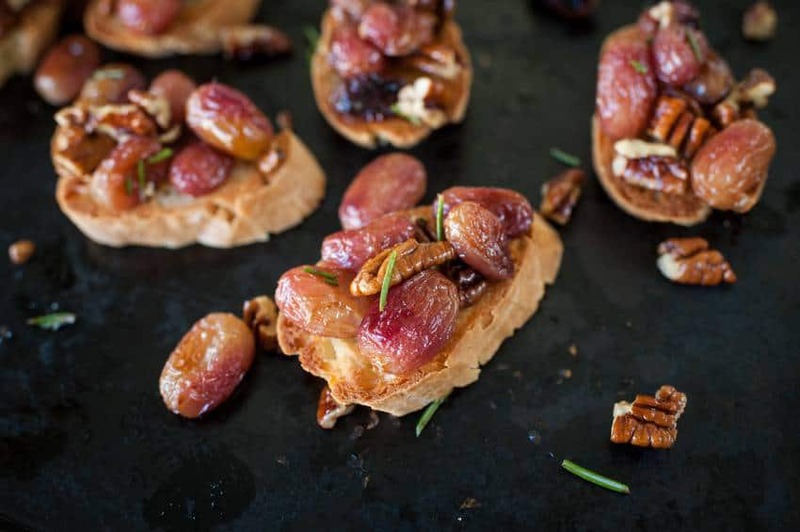 Spoon the roasted grapes and nuts onto the crostini, remove the rosemary from the stem, and add a bit of it to the top of each piece. Serve. This entry was posted in Appetizers & Snacks, Dairy Free, Recipes and tagged appetizers, dairy free, gluten free cooking, gluten free food, gluten free holiday, in season. Bookmark the permalink.